According to a recent CBS poll (April 2014), “three out of four Americans believe in the existence of a heaven or a hell, including 66 percent who think both exist. Eleven percent believe only heaven exists. Seventeen percent of Americans don’t think either place exists.” However, there is one statistic that is missing… death. Death is the ultimate statistic, one out of one will die. There is no escape. In the coming weeks we will be taking a long hard biblical look at hell, heaven, why they exist, and who goes where. This week we must begin our #AFTERLIFE series with the reality of death. Like Tolkein said, death is only the beginning. 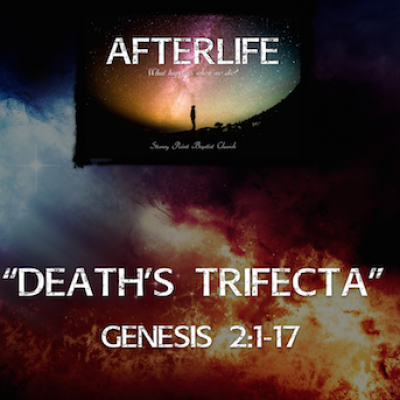 We will be using several passages of Scripture so be prepared to examine what God says about “Death’s Trifecta”.